Mechanical components simple refrigerator consist of hermetic compressor, placed in the bottom of the enclosure; capacitor located on the bottom or back panel of the Cabinet; and the evaporator is placed inside the Cabinet. Diagram of a typical manual defrost mechanism is shown on Fig. 11.2. Liquid refrigerant (as a rule, R-12 and R-134a) enters the evaporator. Compressor, steam is compressed to high pressure, and thus the temperature is raised. Compressed steam passes through a high vapour pressure line and the condenser. In this case, condenser, vertical, natural draft, wire and tube type. Hi condenser high pressure, high temperature vapor gives its heat to the surrounding air. Steam condenses into a liquid. The liquid is shown in the lower end of the condenser. The liquid refrigerant flows through the filter-dehydrator and included in the capillary tube. The capillary tubes of the refrigerant management connected to the suction line to the heat exchanger. Warm refrigerant passes through the capillary tube. 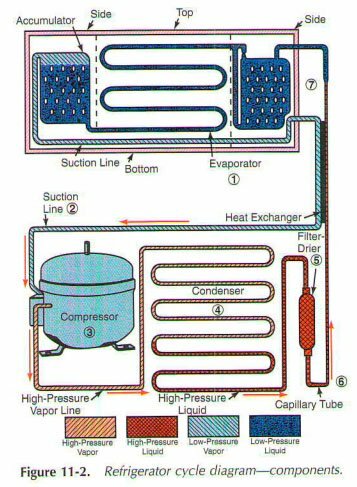 Some of its heat is transferred to the cold suction line pair. Shades increases the heat-absorbing ability of the liquid refrigerant little. This increases the superheat steam entering the compressor. Low pressure fluid gets into the evaporator, and the cycle repeats. This is the simplest type automatic domestic refrigerator. These refrigerator defrosted manually. You must remove frost, how he builds on the evaporator. Ice accumulation on the evaporator significantly reduces the cooling effect. Tine refrigerator off and allowed to remain off for the night. Pallets used to catch the water, which comes from the defrost your refrigerator. Refrigerator off and a pan of hot water is placed in or near the evaporator. This allows you to quickly remove frost. The refrigerator can be returned to normal service in a few minutes. Never use a metal ice scraper to the evaporator. There is a danger of perforation. Evaporator surfaces and internal refrigerator surfaces should be cleaned every time mechanism defrosted. A solution of baking soda and water is best.